You are a group of criminals being transferred to a high security prison. To get there, the police must travel through the ghost town of Silent Hill. However, you wind up trapped inside the town and have to escape it. 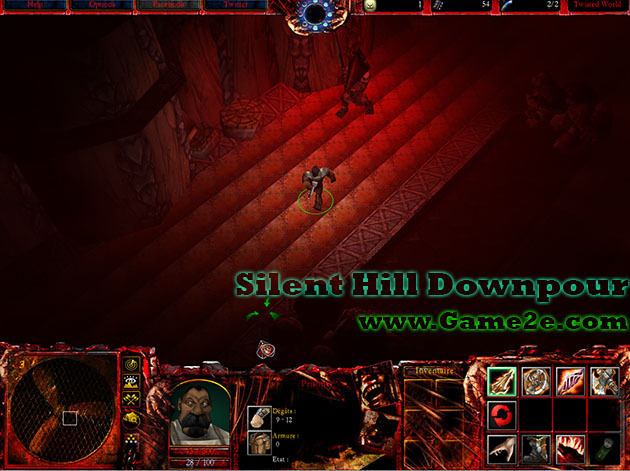 Gameplay : You control a prisoner and you have to escape the town or to face the Pyramid Head. If you are familiar with Maniac With Saw, you will recognize a bit of the gameplay. There is a killer and its victims. However, the killer is chosen randomly the first night. Therefore, you don't know who to trust before nightfall. The map is slip up in two sections : during day time you wanderer in Silent Hill, while in night time you are in twisted world which is more dangerous. if the player plays alone, the IA will take control of the Pyramid Head. Then you will have to kill him or escape the city before he reaches you. Dynamic Camera:The camera follows the players smoothly and can be adjusted. Besides, each building of the town can be visited. Original Weapons : Your character may find various weapons which has special effects (Mace, Wrench or Guns). Some will need ammo, other fuel (chainsaw). Radio : The Radio will allow you to discuss with other players who have one. It also creates heavy noises when an evil creature is too close. Light : Each player has a Torch to see during the Night. However, the Torch consumes your battery and may attract other creatures. Be careful. Stamina : As in Maniac With Saw, your character can be exhausted if he walks or run too much. He will be an easier target for the Pyramid Head. Various Ending : Depending of the remaining survivors and their actions, the ending will change.